These are the projects my friends made at my June stamp classes. All cardstock is cut and scored for my guests, an envelope is provided for each card, and they simply copy the sample provided. This card is a CASE from notimetostamp on SCS. See her original card HERE. The only change I made to the card was to add a sentiment from Warmest Regards stamp set on the front. Guests chose "Happy Birthday", "Thank You", or "Congratulations". This is a favorite stamp set that will be missed as it retired today. NOTE: Double stack foam tape for added dimension. Fold star at lines for depth. This card measures 4 3/4 x 4 3/4 to fit a 5 x 5 CD Envelope. Inspired by Cambria on SCS. See her original card HERE. I love the way the flower peeks through the window of the envelope! I'm in love with this new stamp set, PICK A PETAL! ... so many possibilities! Paper: Palette ‘o Prints DP (May Promo + available in the new ‘07 Fall-Winter Idea Book & Catalog), Purely Pomegranate & Wild Wasabi CS (NEW IN COLORS available in the new ‘07 Fall-Winter Idea Book & Catalog), Basic Black CS. Ink: Basic Black, Wild Wasabi (NEW IN COLORS available in the new ‘07 Fall- Winter Idea Book & Catalog). This card is a case from ltecler's card on SCS. See her card HERE. The Crayon Resist technique was something new for most of my guests. One of my guests said that this was the most beautiful card we had ever done at class! NOTE: Use SU Marker to curl petals of flower for dimension. This card was inspired by amystamper on SCS. See her original card HERE. It may be difficult to see in the photo, but the words "happy" and "birthday" are stamped on the twill tape. Be sure to cut the basketball out with scissors ... punching it out makes it too perfect. Paper: Buckaroo Blue and Cranberry Crisp (RETIRING 6/30/07), More Mustard, Very Vanilla CS, Treehouse DP (RETIRING 6/30/07). This altered pail/bucket from the Target $1 Spot requires no stamping. It showcased the use of the Crop-a-dile which cut through the pail "like butter". It was a simple, fast project. There is a tealight candle inside the pail. I find it quite odd that I'm posting all these recipes .... being in the kitchen is not one of my favorite things, and I don't consider myself that great of a cook. But, I'm a wife & mom that needs to feed her family! 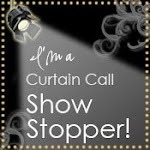 Here is my LAST RECIPE post for quite awhile and I'll get back to Stampin' business! I got this recipe from my SU Upline, Barbara. My DH likes it a little less chunky, so I add one can of Peeled Crushed Tomatoes. I cut the Cilantro in pieces with my Pampered Chef Kitchen Shears. Chill and serve with Tortilla Chips. Here's another Stamp Class favorite recipe. Mix altogether, chill. Serve with fresh strawberries. Spread Cream Cheese on round plate or platter. Layer remaining ingredients in order given. Scoop with Tortilla Chips. As mentioned in my previous post, I hosted a Stampin' Up! Retirement Open House last night. My friend, Leslie asked me to post the recipe to the Loosemeats I served at the Open House on my blog. What is a LOOSEMEAT you might ask? Well, if you're from IOWA, you might know! (I was born & raised in Iowa). In Iowa, they call them Loosemeats, Maid-Rites, or Tastees (at least the area of the state I'm from!). If you're not from Iowa, they are similar to a Sloppy Joe or Tavern. Basically, they are seasoned ground beef served on a hamburger bun. They are one of my family's favorites! Brown ground beef and onion, drain. Mix remaining ingredients and add to ground beef/onion mixture. Simmer in crock pot for 4 hours. Serve on hamburger buns. These are even better as leftovers, warmed up the next day! At last night's Retirement Open House, my guests had the opportunity to create one Make 'n Take card. They could choose the color scheme they liked best out of the three. This was such a simple card with the beautiful new stamp set, BAROQUE MOTIFS, and highlighting some of the new In Colors and Rhinestone Brads. The cards measure 5 1/4 x 5 1/4, and fit in Stampin' Up! 's Medium Square Envelopes. The medallion is simply cut out and adhered with Stampin' Dimensionals or Foam Tape. It became quite fun to see which one each guest chose to create! Everyone seemed to like a different one! This first card uses Soft Sky (new IN COLOR) and Sahara Sand with a Medium Light Blue ICE Circle Rhinestone Brad. This second card uses the new IN COLORS of River Rock and Groovy Guava with a Medium Green ICE Circle Rhinestone Brad. And finally, their third choice uses the new IN COLOR of Soft Sky and Real Red with a Medium Red Circle FIRE Rhinestone Brad. No, I'm not retiring .... many Stampin' Up! Stamp Sets are retiring! Tonight I hosted an Open House kicking off the NEW Stampin' Up! Catalog & Idea Book. I am such a lucky gal! I have some really really great friends who love stamping as much as I do!!! 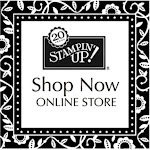 I had TEN of my stampin' friends come over to check out the new catalog, look at some of the new products, do a make & take project, eat, and socialize. It was such a nice evening! I also held a door prize drawing for three FABULOUS prizes! I told them that in order to find out if they won a door prize, they'd have to go to my blog (my way of getting them to check out my new blog!). The winner of this Stampin' Up! Level 3 '06-'07 Hostess Stamp Set, Basket Full of Fun is .... LESLIE M. CONGRATULATIONS, LESLIE !!! The winner of this tin of Stamping Goodies (ribbon, altered jumbo paperclip, chipboard coasters, VersaMark Ink Pad, Stampin' Dimensionals, and many misc. black & white embellishments) is ........ KAREN L. CONGRATULATIONS, KAREN !!!! The winner of this Altered Lunch Box Tin with Dividers to store hand-stamped greeting cards is ....... SANDY B. CONGRATULATIONS, SANDY !!!! Last night (6/27) at 6 p.m. I was getting pretty disgusted with the fact that my NEW SU Catalogs weren't here yet, especially because I had my Retirement Open House coming up the next night (6/28) from 4-8 p.m. Many of my good friends & customers were coming just to get the NEW SU Catalog & Idea Book! In a panic, I starting calling other SU Demonstrators in the area to see if anyone had received theirs. The first three SU Demos I called were not home. On my fourth call ....to Anita ... her daughter answered. Anita was out of town and her daughter said Anita's catalogs had indeed arrived. I casually mentioned my situation to Anita's daughter. Our conversation ended, and within five minutes Anita called me from Florida offering her catalogs to me! I hesitated at first, then jumped at the offer! .... AND so glad I did! ... My catalogs did not arrive until today, two hours into my Open House!!! THANK YOU, ANITA!!! You're a lifesaver!!!! I owe you, big time!!!! Here it is already Wednesday afternoon 6/27, and STILL NO NEW STAMPIN' UP! CATALOGS AT MY DOORSTEP!!!! Don't they KNOW I'm going CRAZY here?!?! To think I actually thought those puppies might come last Friday .... what was I thinking?! Both of my kids and my hubby are on the lookout for the UPS man. I'm sure he'll be freaking out when he sees how estatic I am to see him ... when he finally shows up! I know there are Stampin' Up! Demonstrators all over the country who have already received theirs. Phoenix must be low on the list or something???? This time of the year has come around once again. Stampin'Up! is releasing the New Idea Book and Catalog. Please be extremely cautious of Stampin' Up! demonstrators (SUDs) for the next two weeks. 1. At the distribution centers, please be on the lookout for SUDs. In the past they have been known to cut fences and sneak inside covered with close to coccoa ink in hopes of blending in with the trucks. 2. The ladies have been known to run after your trucks. If they catch you and ask if you have a "package" for them, be careful with your answer. They do not take "no" for an answer. If you do not have it, just say " I will double check in the back" and turn and run as fast as you can to your truck and drive away. Do not turn back and look, just keep going until you are a safe distance away. 3. They have also been know to drive up next to you at a stop light in their mini vans and SUVs and ask if you have a package for them. Turn up your radio and pretend you cannot hear them. Do not let them approach your delivery truck at an intersection. SUDs have been known to stop traffic and throw all your packages off the trucks until they find their new Idea Book and catalog. 1. Be sure you have fixed your squeaky brakes, If not - park your truck two blocks away so the SUD can not hear you coming. 2. Put in your earplugs and secure your safety glasses. 3. If you see children looking out the window, put your finger up to your lips and say "SHHHH".. They are on a "lookout" for you and are being paid to "alert" their mothers (SUDs) when they see you coming to the door. 4. Approach the front door and very quietly, set the package down in front of the door (Make sure you place it in FRONT so when she opens the door, the box will be in the way and give you a little more time to escape). 5. Back up as far as you can and reach for the doorbell, (BE READY TO RUN !!!). Ring the doorbell and make a mad dash back to your truck and drive away....DO NOT LOOK BACK !!! The UPS corporation is informing you of this because in the past years, SUDs have been known to scream at the top of their lungs with excitement and try to tackle you with hugs for delivering their catalogs. After you have been smothered with appreciation for getting them their catalogs on time, watch out for flying packaging material as they will open up the box before you have had a chance to leave , or they have gone inside. Best of luck to you with this mission, and remember ... Let's Be Safe Out There!!!! I discovered Splitcoaststampers almost two years ago, and believe it or not, this is the very first time I've participated in a Weekly Challenge. Today's challenge was a Featured Stamper's Challenge, CASEing (Copy And Steal Everything) a card from said Stamper's Gallery and changing two or more things from Stamper's original design. The featured stamper today was Cambria Turnbow (FS20), one of my favorite artists! See her gallery here: http://www.splitcoaststampers.com/gallery/showgallery.php?cat=500&ppuser=61. This is Cambria's card that I chose to CASE: http://www.splitcoaststampers.com/gallery/photo/591078?cat=500&ppuser=61. I can't tell you how big of an impact this website http://www.splitcoaststampers.com/ has made in my craft! 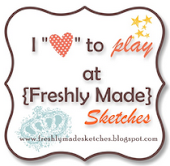 If you stamp, you MUST check out this site, and check it DAILY!!! 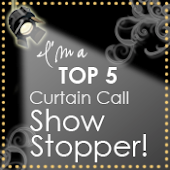 (See link on my sidebar too!). SplitcoastStampers (SCS) is FULL of ideas, techniques, tutorials, and more! It is FREE, although membership has it's privileges! ANYONE can post their stamping and/or scrapbooking creations, other stampers leave nice comments on your work, and is a HUGE resource for me! There are some very talented ladies posting their work on this site. Artwork is also categorized by Stampin' Up! Stamp Set NAMES. If you have a certain stamp set you'd like some ideas for, simply go to that stamp set's gallery. There are so-o-o many aspects to this site, it's impossible for me to list them all. It takes some time to get a feel for how the whole site works, but it's worth the effort! You might say I'm a SCS Stalker, as I'm on there all the time! While you're there, check out my little gallery. Go to "gallery", click on "member galleries", and search for stampinat6213 ... or click here http://www.splitcoaststampers.com/gallery/showgallery.php?cat=500&ppuser=41782. Feel free to leave comments too ... they make my day! I'm like a kid at Christmas right now waiting for the NEW '07 Fall-Winter Catalog & Idea Books to arrive at my doorstep! You can bet that I'll be running to the door every time I hear anything that remotely sounds like a UPS truck! Once I get it in my hot little hands, watch out!!! I'll be finding myself a quiet little corner for a few hours! Every year, Stampin' Up! retires an extensive list of Stamp Sets, Wheels, and Accessories. Trust me, they come out with NEW product that is even better! OK, Mr. Brown .... you can stop by ANYTIME now!!!! 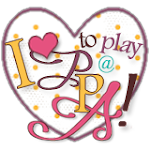 At my very first stamp class as a Stampin' Up! Demonstrator, I demonstrated how I score CS (cardstock). It was a lightbulb moment for some of those in attendance! Although there are several ways to score CS, this is my preferred method and is the way I have always done it. It is so-o-o simple, yet provides a nice even score line and a fold without crinkles! Supplies Needed: Paper Cutter (mine is the Fiskars brand from Stampin' Up!). It cuts paper up to 12 inches, and features easy-to-read grid lines and black base. There are scoring blades for this cutter, but I find it much easier to grab my Stampin' Up! Bone Folder rather than replacing the blades each time. Step #1. Cut CS 5 1/2 x 11 inches. Step #2. Line CS up to the 4 1/2 inch marking ... make sure the bottom of the CS meets up evenly with the black base of the cutter. The 4 1/2 inch marking is the halfway mark for folding the CS in half. Step #3. There is a groove in the black blade guide of the paper cutter. This photo shows the Bone Folder pointing to the groove. Step #4. Simply run the Bone Folder down the length of the CS, using the groove as your guide. Don't put too much pressure on your CS, as it may tear. With practice, you will be able to achieve the proper amount of pressure for a nice score line and even fold with four corners that meet when folded. * To provide additional information and ideas for my customers. The time we spend at monthly stamp classes just zooms right by, and we just can't cover everything in that limited time frame. There is so much more that I'd like to share! * To enhance my relationships with other stampers and papercrafters. There is a HUGE community of stampers out there --- a wealth of ideas and information! * Those of you that know me, I am a HUGE CASEr!!!! (CASE means COPY AND STEAL EVERYTHING!!!) It is so-o-o much easier and faster to just copy someone else's work which is totally acceptable when credit is given. I think having a blog might give me the push that I need to be more creative in designing my own cards and craft items. Ultimately, I'd love to have my work published someday but that won't be happening unless I start doing more of my own original designs! THANKS for looking! I LOVE LOVE LOVE comments! 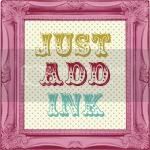 I've been reading rubber stamping related blogs for several months now, and have gotten so many great ideas from them! After a few weeks, I had the urge to start my own blog. I'm finally giving into that urge ..... so here we go!!!!!! !